Gobi & Khar Khorum Tour. Central & Northern Mongolia Tour. Open Steppe Biking to Hustai National Park. Biking in the National Parks – Terelj & Bogd Khan Uul. In the Discovery Mongolia tour, we offer you the combination of the best highlights of the country for your vacation in Mongolia. We will start the tour exploring the Gobi desert region that covers one third of the country’s total area. Among many things you will see ice in the Vulture Valley and beautiful sand dune at Khongoryn Els. For fans of natural formations you will explore the Flaming Cliffs, Baga Gazar rocky mountain and Tsagaan Suvraga. Finally, before leaving this area we will have a last visit dedicated to the Ongi temple ruins. Traveling through the vast steppes of Central Mongolia, we will stop to explore Kara Khorum the legendary capital of Genghis Khan’s Mongolian Empire. During this pause we will visit the Buddhist Erdene Zuu Monastery and a local museum about the history of this city. Then we will head towards the North, stopping on the way to many fascinating places. You will have a break at the Tsenher Hot Springs before a hike around an extinct volcano and the Great White Lake. After that you will enjoy the beauty of the Huvsgul Lake where you will hike and meet reindeer herders. The surrounding of Lake Huvsgul is beautiful with rich flora and many animals. It will then be time the head back towards Ulaanbaatar. On the way we will stop to visit the second largest Buddhist monastery Amarbayasgalant and the Uran Togoo extinct volcano mountain. Every day we will set our tents in beautiful places where you will merge with nature. You will enjoy the nice meals prepared by your guides and spend the evenings playing cards or singing around a warm fire. Day 1. Baga Gazar Mountain Nature Reserve. Day 2. Tsagaan Suvarga Mud Stone Nature Formations. Day 1. Leaving Stepperiders to Baga Gazar Mountain Nature Reserve. We will drive half day to reach the Baga Gazar mountain nature reserve. These mountains consists of granite stone massifs and are located in Mongolia’s granite rock zone, in the middle of Gobi desert. The ruins of a small monastery are on the south east part of the mountain. The area has got many species of wild animals and birds, such as ibex, argali, vultures, hawks and eagles. In the evening, we are transferred to our camping spot. Overnight in tents. 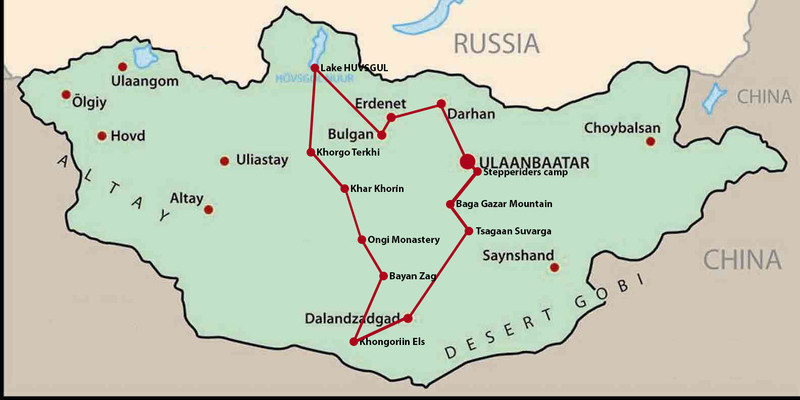 We will head further into Mongolian Gobi desert which occupies one third of the country. On the way, we will have a break at the Tsagaan Suvarga mud stone nature formation place. We will reach the Tsagaan Suvarga and will go on an exploratory hike to see different nature formations. We will start driving to Yolyn Am, known as ‘Vulture Valley’. Yol Am and the Dungene valley is very picturesque place with ice in summer and surrounded by sheer rocky walls, forming incredible canyons. Go for a short hike and take photographs of the charming landscape and wildlife. You will then visit the Gobi museum. This area is situated in the Three Beauty of Gobi Mountain National Park which covers the most southern points of the Altai Mountains. Stay overnight in tents, in valley of mountain range. Day 4. Khongoryn Els /Sand Dunes/. We will drive to the sand dunes called Khongoryn Els. It is one of the largest sand dunes in the country and it lies 125km long, 20km wide and 400m high. It is a big challenge to climb to the summit but it is very rewarding to watch the sun set and rise from this panoramic view. Camping overnight in tents, close to the sand dunes. In the morning, we will drive 4 hours to reach the famous Bayan zag, Falming Cliffs/, where important fossil discoveries have been made. It became famous after the visit in the 1920s of American paleontologist Roy Chapman Andrews. This area is known for the first discovery of dinosaur fossils. There is also picturesque saxaul forest after which the place is named and colorful rock formations. Stay overnight in tents, near the cliffs. Day 6. Ongiin Khiid Monastery Ruins. We will head off towards Central Mongolia and the Gobi desert will slowly disappear from our sight. We will drive until we reach the Ongi monastery ruins. Over 1000 monks used to live in this monastery built in the late 17th century for the first visit of a Dalai Lama in Mongolia. The complex was destroyed by the communist party in 1939. Luckily, it was reopened in 1990 and the current Dalai Lama visited it in 1992. Stay overnight at tents, on bank of the Ongi river side. Day 7. Kara Korum Ancient Capital & Legendary Buddhist Monastery Erdene Zuu. This morning we will travel to Kara Korum, it city was the ancient capital of the Mongolian empire created by Genghis Khan in 13th century. We will visit the legendary Erdene Zuu Buddhist monastery which was built on the ruins of Kara Korum. You will a lot about the history of Mongolian Buddhism. After that, we will visit a local museum and get full information about the ancient capital’s history from its creation to day. In the evening, we transfer to camping a spot near the famous Orkhon river. Tents, B+L+D. Day 8. Tsenher Hot Spring, Khangai Mountain National Park. We will start heading towards Northern Mongolia’s beautiful scenery and mountains rich with grazing livestock. On the way we stop overnight at the Tsenher Hot Spring where you will relax in the spa. Stay overnight in tents, in a beautiful camping spot. B+L+D. Day 9. Khorgo Terkh National Park & Great White Lake. In the morning, we will travel through beautiful landscape, forested mountains and rivers to finally stop in the Khorgo Terkh National Park which is famous for its scenery park. We will hike to get a closer look at the extinct volcano mountain and the Great White Lake. Stay overnight in tents, B+L+D. Day 10 – 11. Jargalant Hot Spring & Murun City of Huvsgul Province & Lake Huvsgul. We travel in Northern Mongolia for two full days. Enjoy the beautiful scenery of mountain passes, rivers and the hundreds of livestock grazing next to Mongolian gers. Discover the hospitality of nomads sharing some milk tea and food in their ger. The first night will be spent near the hot spring or with a nearby nomadic family. Next day we will stop at Murun the capital city of Huvsgul province and, late evening, we will arrive at lake Huvsgul where we will set our tents for the night. B+L+D. Day 12. Leisure Day at Lake & Visit at Reindeer People. Today we will have a leisure day at lake Huvsgul and enjoy hiking on the bank of the lake. You can even have a swim if you are not too sensitive to cold. Lake Huvsgul is the top scenic attractions of Northern Mongolia surrounded by high mountains. It contains 65 percent of Mongolia’s freshwater resources and it is the second largest freshwater lake in the country. We will spend the afternoon visiting reindeer herders and try to ride a reindeer. Only a few people of this ethnic group are left. They live in very harsh conditions in the high mountains raising their unique reindeer. Contrarily to steppe nomads, the reindeer herders live in tipis. Day 13 – 14. Uran Togoo Nature Reserve, Bulgan Province. We will be heading back towards Ulaanbaatar. It will take two days to travel to Uran Togoo extinct volcano and its mountain nature reserve. We will cross rivers, pass mountains and visit nomadic families. We will arrive late in the evening and stay overnight in tents, B+L+D. Day 15. Second Largest Buddhist Monastery, Selenge Province. In the morning, we will start our trip and stop to visit Bulgan capital city and Erdenet mining city. Afterwards, we will jump back into nature scenery and visit Amarbagasgalant the second largest Buddhist monastery in Mongolia and explore its surroundings. We will stay overnight camping on the bank of a stream. It will be the last opportunity to see hundreds of yaks and hang out with goats and sheep. B+L+D. Day 16. Travel back to Ulaanbaatar or Steppe rider’s Camp. This will be our last day trip and we will be heading back to Ulaanbaatar. We will travel through beautiful places and late evening we will arrive at the capital or Stepperider’s camp.